Marriage is worth fighting for. Love is worth fighting for. While I didn’t fight hard enough for my first marriage, I no longer have the philosophy that I have to have a perfect record in a certain category of life in order to write about it. Mistakes have a way of fertilizing the soul like nothing else can-when a person allows it. You know what I wish? I wish my silly, immature, prideful self would have permitted a wise woman to speak into my life when I was at the crossroads of my first marriage ending all those many years ago. I wish that the wise woman would have prayed over me while I was standing there to hear her words and that I would have listened with a whole heart. 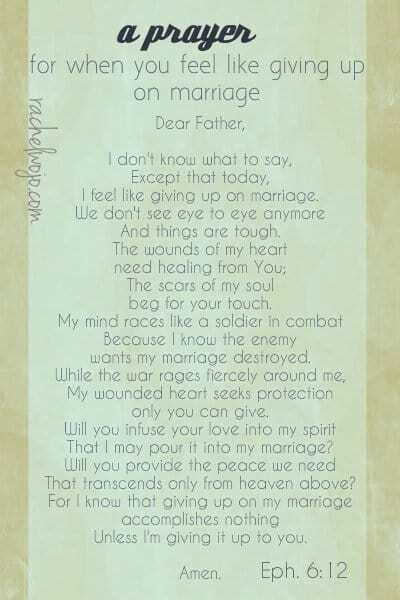 And I wish my love for God would have been stronger so that I could have prayed something like a prayer for when you feel like giving up on marriage. Giving up is not an option; but prayer- prayer is always an option. Many circumstances beyond our control and other factors, such as abuse, affairs, and unacceptable behaviors, leave a person with no choice but to physically remove themselves from a situation. If you find yourself in any such situation, please, please seek professional counsel and assistance immediately. But for those marriages where she just no longer loves him or he likes the way someone else at the office treats him. Or the honeymoon is over and the monotony of work and life has crept in. Or either party made a costly mistake and no one wants to fight for the life and love they once had together… here’s a prayer for when you feel like giving up on marriage. I feel like giving up on marriage. The scars of my soul beg for your touch. Because I know the enemy wants my marriage destroyed. My wounded heart seeks protection only you can give. That I may pour it into my marriage? That transcends only from heaven above? Unless I’m giving it up to you. Be sure to check out the NEW Prayer Directory with the “Prayers for when series…” outlined! Love to see you on Facebook! Thank you for this post! It is literally what was on my mind this night and I heard my email come in and just read the subject line! Tears just filled my eyes because it’s like somewhat of a affirmation that god is listening. Thank you! Blessings, Nieve. God cares about every hair on your head. Of course, he’ll send a message to you in this nature. He loves you so much! Prayers over your marriage today. prayers, Tracy! OH my heart aches for you. May the God of peace surround you with his presence and may you feel him lift your spirit. I am praying for you. We were in those very circumstances 6 years ago, with a wayward daughter, and our marriage in shambles. It was also a very long road with my daughter. It IS very painful. But God if you seek Him, will show Himself to you, fight for you, and bring good out of this painful period of your lives. He will continue to bring good out of this for your son and for your lives. You will look back and see the Lord’s hand in this. We see and learn Jesus and His ways and His love so much more clearly when we have trials. God can reach a prodigal in a way you can’t possibly. God has His love and all of His infinite resources to reach your son. It takes looking at Him in trust instead of looking at what you see happening with your son. He showed me He was not going to restore, but to create a new thing. Jesus is always looking behind the scenes in ways we don’t see. Once, I was given a vision of a very strong muscled arm holding a spear, standing at attention, with just a profile jawline, standing guard. I told a friend about this vision, and she mentioned that we can’t see the Lord’s face and live. I wept because Jesus told me this was His strong arm, fighting for all of us. Your son cannot go any place so dark and escape the Presence of Jesus. To Jesus the night and the day are both alike. Psalm 139 talks about this. He has your son surrounded, and you surrounded by His Presence. He also has you and your husband surrounded by His Presence. His Angel, warrior armies surrounding you. He is fighting for your marriage. I wish I could say things with our daughter are fixed, but I see God’s hand in all of this. I have to remember this is not in my time, and whatever God does, He does thoroughly and completely. Your son, and your marriage are not bigger than God. God is infinitely larger and can do more than you can think or even ask. I remember not knowing what to ask for anymore. I surrendered, I was too exhausted and numb. I ate the psalms and Isaiah and the letters of John, and could only pray them back and kept a journal of those scriptures/promises when I heard the Lord’s voice. Then do the next small thing He asks of you, mostly be close to Him. I’m sorry this is so long, it is just as much for me to remind me of the lessons I have learned and am continuing to learn. I shall pray as I feel the Lord leading me. praying for you dear Mavis. I was praying about my marriage, decided to pin some pins on Pinterest “spiritual words of wisdom” I went to a Pinterest board there was a pin “A Prayer when I Feel Lonely” from RachelWoj.com, which led me to your website. While browsing your site I came to this post! I instantly thought this is God! Marriage is worth fighting for. Love is worth fighting for. I agree with this post. As I have been standing for my marriage for 2 years now, this is my second marriage. My husband speaks of divorce, I do not want a divorce. I Believe I am suppose to Stand Fight for my Marriage. I pray that this is God’s will and not my will. I declare and decree my marriage restored healed! Please pray with me. Thanks in advance. All the Glory to God! Jackie, praying with you and standing for you!! God answers prayer! I hadn’t read this email yet but did today. My husband and I have been separated for 2 1/2 years. He is pushing for a divorce and I am refusing. Today I was at a point of just agreeing and giving in to my husband. I have held firm to the promise from God that He would restore our marriage but it hasn’t happened yet. I was ready to give up. Then I read this email. Thank you, Rachel. I read it at the time I needed it most. Bless you, Kathy. May the Lord lead you each step. My heart aches for you and I pray you feel God’s hand on your life each day. Thank you. I pray God will bless you and your family as you reach people through your ministry.